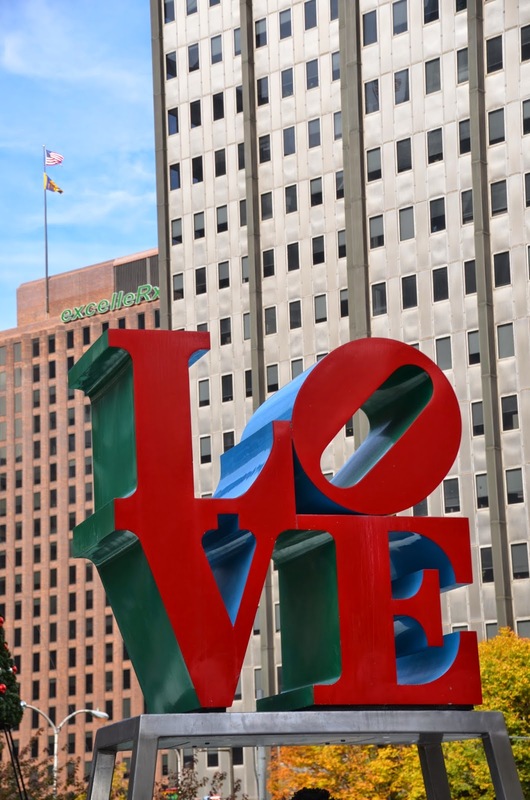 LOVE Park, located in Philadelphia, was built in the 1960s. Around the 1980s the park became famous for skateboarders because the way the park was designed. With curving stairs and ledges, is perfect for the sport. In the early 2000s, the city banned skateboarding in LOVE park. Even with the ban, I saw plenty of kids skateboarding the day we visited the park. 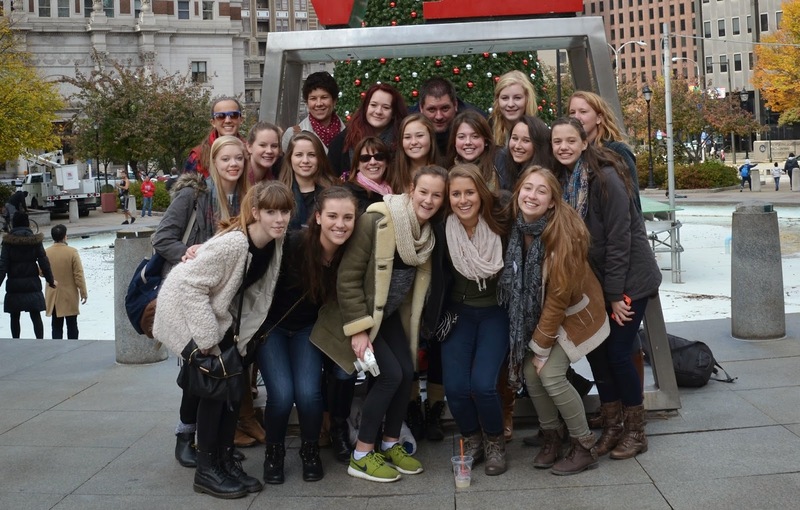 (I'm in the middle of the group, with my sunglasses on). Normally LOVE park has gorgeous fountain behind the 'LOVE' sign, but it gets turned off when the city puts up the Christmas tree. They were putting it up the day we were there. Close to LOVE Park is a courtyard filled with HUGE game pieces. I don't know if this is unique to Philadelphia, but it's pretty cool! In front of LOVE park is Philadelphia's City Hall. 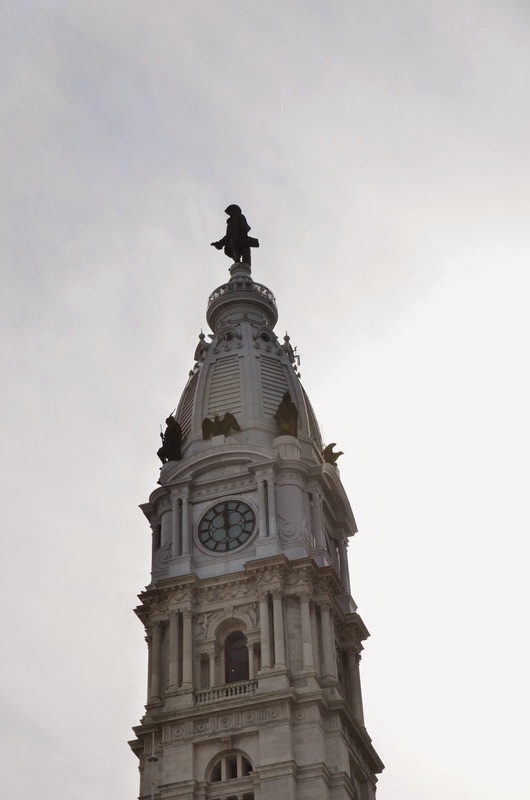 On top of the building is a statue of Pennsylvania's founder, William Penn. Until 1908, this building was the tallest in Pennsylvania. The William Penn Statue is gorgeous, but the day we were there was a cloudy, overcast day and I couldn't get a good photo of it. Tid Bit of history: Contrary to belief Pennsylvania was named after William Penn by King Charles II and not Penn himself. Closest thing we have to Quakers are the Amish folks. I couldn't even tell you if there are any more Quakers. LOL to the joke!